Push the boat out with this classic shellfish platter. For the garlic and chilli butter, put the butter, garlic, chillies and herbs in a large glass bowl. Season with salt and pepper and mix well. Spoon the butter onto a piece of cling film, roll it into a log shape, twist the ends and place in the fridge to set. For the mayonnaise, cut a square of kitchen foil big enough to wrap the garlic in a single layer. Put the garlic on the foil, drizzle over the olive oil, sprinkle with the thyme and season with pepper and ½ teaspoon of salt. Seal the parcel and roast for 20–25 minutes. Discard any mussels and clams that fail to close when you tap them against the side of the sink. Put them and all the other shellfish in a large baking tray. Cut the butter log into thin slices and dot it over the shellfish. Roast for 15–20 minutes. Discard any mussels and clams that fail to open. Meanwhile, for the socca bread, put the chickpea flour in a large bowl. Add the salt and olive oil, then gradually pour in enough water to make a batter with the consistency of double cream. Heat a medium frying pan and add a glug of oil. Pour in a little of the batter to make a layer around 0.5cm/1/4in thick. Cook for 1–2 minutes, turn over, then cook for another 2 minutes. Keep warm, and repeat the cooking until all the batter has been used up. 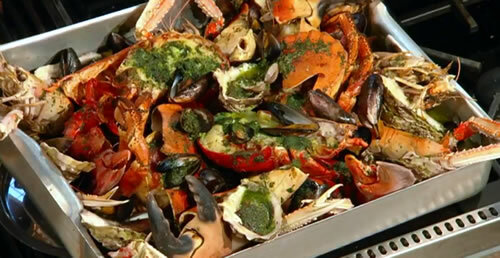 To serve, put the shellfish on a large platter, sprinkle with parsley and serve with the garlic mayonnaise and bread.